Marketing a business to secure quality leads has always been challenging, but with the plethora of tools available today, it’s becoming more of a nightmare. As a result, many businesses are becoming reactive and jumping on and off the latest bandwagons – Facebook Twitter, YouTube, Pinterest, door hangers, ads, podcasts, auto-send cards, and more being introduced virtually every day. Their hope is that something will stick and someone will call. Feeding this frenzy is a host of “experts” all claiming to be the best, to know all there is to know about every new tool, almost before they are available. At Corridor Communications, we call this approach “Bandwagon Marketing,” and the “experts” the “wagoners,” are the people driving the wagons. Unfortunately, Bandwagon Marketing typically does more harm than good; it costs more money, time and effort and delivers a very minimal return. The truth is, it’s time to get off the bandwagon and focus on the outcomes, on what you as a business executive and owner need, want and desire to achieve over the long term, and then to examine the fires that may be causing sleepless nights. This is the foundation of Outcomes Marketing. Outcomes Marketing is a process of delivering the right message to the right audiences using the right tools at the right time. It starts with the vision an executive imagines for their business, including its exit strategy. It has a starting point and a middle, but it never stops. It can be improved, perfected, changed, and paused…but it never completely stops. Why? Because a business must have the mindshare Outcomes Marketing creates… before it can build market share and realize the end goal. Outcomes Marketing specialists have inquiring minds. They challenge business owners and executives to think through their goals and to get to the heart of a problem or need. Then they apply their expertise to create innovative programs that deliver meaningful results, build awareness and create preference, so when a decision has to be made, the business already has an advantage. By definition, an expert has mastered – learned all there is to know – about a subject. When applied to marketing, it implies that marketing and social media are stationary objects that can be learned completely. This could not be further from the truth. In the fast-paced, constantly changing world of marketing, social media, apps, and communications, no one can honestly claim to be an expert; the best we can claim is that we have expertise, and that we are still seeking knowledge. Which would you rather work with – an expert who has mastered a subject to a certain point or a specialist who has deep-seated expertise and continues to grow, learn and develop new ideas and skills? All communication initiatives must evolve to address the realities of dynamic markets; however by integrating Outcomes Marketing strategy with creative tactics and outside expertise, teams can generate effective, consistent dialogue that prompts action among targeted audiences that is critical for business success. 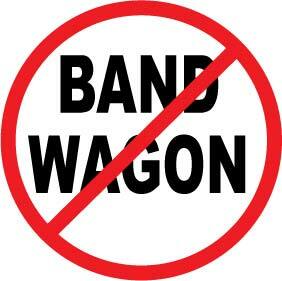 Isn’t it time you got off the bandwagon? To learn more about Outcomes Marketing for your business, email us at corridorcomms@corridorcomms.com.